No Cords, No Controllers, Just you! 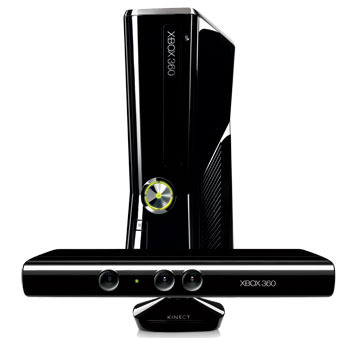 X Box 360 Kinect brings games and entertainment to life in extraordinary new ways, with full body play. Arms, legs, feet, and hands, with Kinect there are no controllers, just you. It’s so natural, so intuitive that technology evaporates, letting the natural magic in all of us shine through. All you need to do is jump in! You can add the new sensor bar to any Xbox 360 or purchase the whole console. XBox Kinect is NOW available! No Controllers - you use your entire body as a controller. Easy to add new players - just hop in! Show off and Share: Kinect takes pictures of you playing which you can send to Social Networks. Kinect names your photos. Example Rocky! A great way for kids to become active while player video games. When watching movies you can speak to the console and the microphone will pick up your voice. Examples - Play movie, stop movie, rewind. 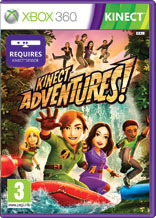 Play Kinect Adventures! We got to play some of the new games! 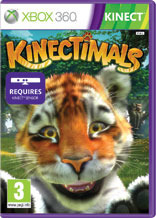 Kinectimals transports you to a magical island where you can adopt any of five different adorable furry friends. Bond with your pet and build a friendship as you explore new places and make exciting discoveries. Teach your pal some new tricks, and then play together and complete fun challenges. The first time your little buddy greets you with a wagging tail and a friendly smile, you’ll know that it’s the beginning of a lasting friendship. We loved this game. It's perfect both younger and older players. You can adopt, raise and teach a Cheeta, Tiger, Blank Panther and many more animals. The best part is that you get to play games such as beach volleyball and jump rope with your pet. If you want to pet your animal and give their belly a scratch all you do is reach out and pet them, they even purr! 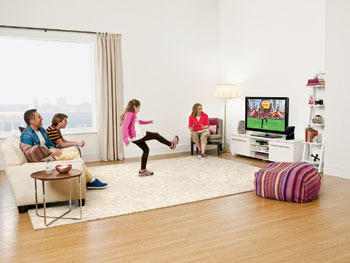 Kinect™ Adventures will get you off the couch and into the game in a whole new way. You and your friends and family will jump, dodge, and kick your way through 20 pulse-pounding adventures set in exotic locations. Work together as you navigate through roaring rapids, challenge obstacle courses or save a leaky underwater laboratory. Show off and share your accomplishments online with Photo Moments and Living Statues. The spirit of adventure awaits! This game really gets you off the couch. We soared through rapids, jumped obstacles and collected coins. You can play solo or 2 player. Feel like joining in? Just step up and the sensor automatically sees you and beings you right into the game. If you like your heart racing then this game is perfect for you! 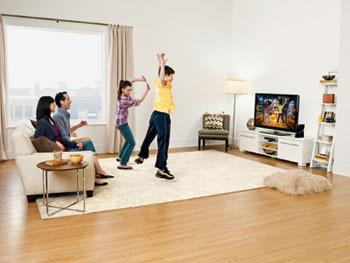 With Kinect Sports, anyone can become the next star of the living room. 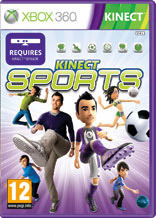 Kinect Sports brings intuitive full body motion to a collection of sports, no matter the experience level. See a ball? Kick it. Is that a javelin? Throw it. You can team up with friends, play solo or challenge players online with Multiplayer on Xbox LIVE. With a variety of games, sports and game modes, there’s always a challenge to bring out your inner athlete. Kidzworld loved the fact that you can choose to play left handed or right handed. At the beginning of every game, just lift the appropriate hand and the system recognizes. We played Table Tennis, Bowling and Track and Field! This was our favorite game we played. This was a really cool interactive game. You use your hand as the paddle. The music and crowd are really fun and engaged. Makes it feel like you are playing in real life. The commentary is very humorous and does not hesitate to call out mistakes. A great feature are the special shots, including the firey ball and lights up the screen and is almost impossible for your opponent to hit!. This game is great for both beginners and advanced players. You can bowl with one arm, between your legs, or even Shot Put it! The sensor comes in very handy for this game. As you move left and right you also more across the lane allowing you to aim or even add spin to your ball. It is also very easy to add new players. There are many activities to choose from. We played Javelin and 100 Meter Dash. We found Track and Field to be very real life. It's a great way to get moving well still having fun. For Javelin you have to run on the spot and thrown the javelin as far as possible. At first we weren't very good! The 100 Meter Dash was really fun. You can even compete against another player. Make sure you have high knees to gain speed! Set. Let Your Body Go! 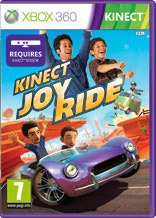 Kinect Joy Ride combines the fun of classic karting with the controller-free game play of Kinect. Enjoy five different game modes as you race through three unique worlds with stunning landscapes. Navigate obstacles, power slide through corners and fly off jumps to wow your opponents with mid-air acrobatics. Then earn boosts, power-ups and other items to turn up the competition and the fun. It’s racing action, Kinect style. This is a game everyone will love! If you are into car racing and competitions then this is the game for you! You can play solo, 2 player, or through Xbox Live. A fun feature about this game is you actually hold your hand up as if you are holding a steering wheel. You use your hands to steer the car and you whole body to drift. . Our favorite feature is the tricks you can do with your car. As you go over jumps you can lean forwards, backwards and side ways to do flips, backwards flips and even combos! Kinect, like other platforms allows you to create you own avatars. These ones are very customizable with a ton of options to choose from. You can pick your outfit, hair color and style, facial expressions, eyes, mouth and even props! Check out the Xbox website for more info on Kinect! Will you buy Xbox Kinect?